Sarah is 4 years old, but she still looks, plays and runs as when she was 1. Ive had dogs all my life, but this is the first time I have a Jack Russell as my baby, friend and partner. 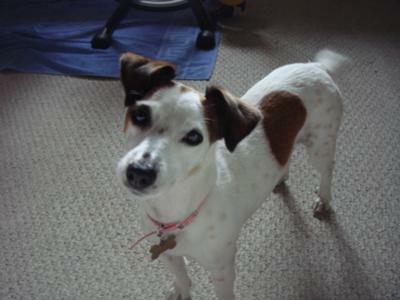 I can say something about this...I will never have another dog that is not a Jack Russell, and Sarah has been the best. She has really been our baby for my husband and me. We love to run for sports, and Im a dietitian also, so we have a very healthy lifestyle. So..she also does!! She goes for a 45-60 minute run 4 times a week or 5...and if she doesnt go for two days in a row, she gets down and you can say when she is like begging us to take her for a run each day. When she watches me changing clothes, she starts crying and shaking as crazy, jumping toward the front door and barking as saying to us : "Pleeeease take me with you!!" Also, she plays soccer with us in the garden, plays with a tennis ball to catch it back and forth, and with a basket full of toys. She never gets tired!! There are no dogs as Jack Russells, and mine, has changed and marked my life and my family's for real and forever! !